At Norwich Telecoms, we understand how important a reliable telephone system is to your business. We offer tailor made maintenance contracts to ensure that your investment is in the best possible hands, should any faults arise. 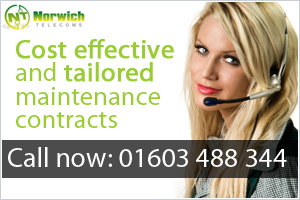 For more information on how a Norwich Telecoms maintenance package can protect your business, please contact us. All maintenance packages are subject to our standard terms and conditions. Preventative maintenance visits – Each year, on a mutually agreeable date, an engineer will attend your site to inspect your telephone system and its associated cabling. The cabling will be tested to ensure that it has not been damaged or degraded. With an annual preventative maintenance visit, we aim to pre-empt any faults before they occur, further reducing the likelihood of any potential downtime. Preferential customer status – As a maintenance customer, you are assigned preferential customer status, making your business our priority for any upgrades or changes that you may require. Peace of mind – As a maintenance customer, there is always someone there to answer any queries you may have regarding your telephone system. If any faults occur, you can rest assured that help is only a phone call away! Budget and savings – For an agreed maintenance fee upfront, all parts and labour are covered. Flexible payment terms include monthly, quarterly and yearly direct debits. You’ll know exactly what you’re paying and when, without any costly surprises should the unfortunate happen! Telephone & email support – For any queries relating to their phone system, we’re always here to help. Maintenance customers will be given access to our helpdesk for both telephone and email support. Labour & hardware savings – We also offer a 10% discount for any upgrades or changes that you require outside of the scope of your maintenance contract. SLA response times – A guaranteed service level response time of 4 hours is available to all maintenance customers. Dedicated account manager – All maintenance customers are assigned an account manager who will be your single point of contact and oversee all works and faults through to their resolution. Remote fault resolution – Where possible an engineer will remotely dial in to your phone system to resolve an issue. Removing the requirement for travelling time to site, issues can be resolved much quicker! Complete this form, briefly outlining your current telephone system and existing maintenance contract details, and we’ll be in touch to discuss how we can save you money and provide you with fantastic, local service. * – denotes a required field.